I always assumed this was either not possible, (without using VMware converter,) or at least very difficult. I downgraded one of my test ESX boxes from 6.5 to 5.5 this week, and needed to lower the hardware versions on some of my VMs accordingly. Change directory so you are in the right ‘datastore’, locate the VMs folder, and change to that directory. You are looking for the VMs .vmx file, (shown below in green). 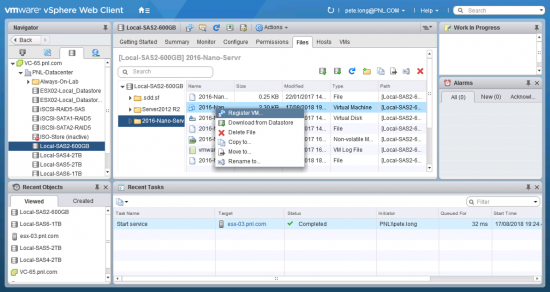 Edit the file using ‘vi’ and locate the virtualHW.version value, here it’s version 11 (ESX 6.0). Here I’m changing it to version 10 (ESX 5.5). Then remove the VM from the inventory, navigate to its .vmx file and select ‘Register VM‘.